We were on the road somewhere outside Sydney when a hotted-up Mazda zoomed up next to us at the lights, twin cams throbbing. From each rear window protruded an Australian flag, fluttering like when you accidently shut your frock in the door. We sat there, waiting for the green, making cynical old fart, iconoclastic noises about faux patriotism, Bogans and drivers who just cannot sit behind a caravan. Meanwhile, Australia Day has come and gone; Shane Howard got a gong and used the occasion to highlight the iniquities and injustices of this colonised land. As an accidental Australian (twice emigrated) I hesitate to write anything acerbic about this country, my adopted home. I did not go to school here, so even though I studied Australian history at university and watch Better Homes and Gardens, there are gaps in my education through which you could drive a Holden Ute laden with slabs of beer. But I seize every opportunity to learn more, to lift the rug and look under it for First Nation stories. As chance would have it, we stumbled across two relics of our colonial past while on a circuitous road trip to the Illawarra Folk Festival and back via Tamworth. The first was the remains of a convict-built, 43-kilometre road near Wisemans Crossing in New South Wales. The Great North Road was built by convict labour between 1826 and 1834 to provide a freight route from Sydney to the Hunter Valley. From Wisemans Crossing (free ferry service, thanks to the NSW government), you can drive up the road a piece, park and walk your way up Devine’s Hill. It was a hot day, but we persevered, marvelling at the 19th century engineering ingenuity and the harsh life lived by convicts. As we read about the convicts who were sentenced to serve time on ‘Iron Gangs’ to build roads, our aching calf muscles seemed a mere trifle. British convicts who had committed offences in Australia would often be sentenced to work in chain gangs, their legs in shackles. Once they had served their sentences, the shackles were removed and they were transferred to a Road Party. Easier to work without shackles, but the work was still hard yacker, chiselling 250kg blocks out of the sandstone hills and building buttresses and retaining walls. The chain gangs used hammer and chisels to make blocks or they bored holes in the sandstone using jumper bars and sledgehammers. The engineers then placed explosives in the holes and sliced large blocks from the hills above. 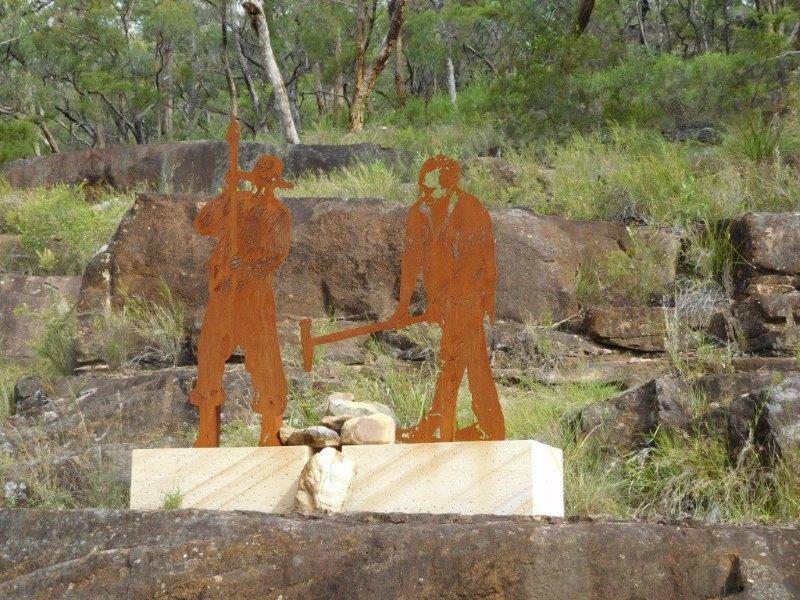 There are tributes to the convicts along the 1.8 km Devine’s Hill walk which tell of the harsh terms of crime and punishment in those times, often being incarcerated for lengthy periods for what we would see as trivial offences. Later, we were heading for Nundle, a small town 60 kms from Tamworth, around which something of a fringe country music festival has developed. On the way, we stopped at Wallabadah, which hosts Australia’s only memorial to the First Fleet, which arrived in Port Jackson on January 26, 1788. The personal mission of stonemason Ray Collins, the First Fleet Memorial is a small park festooned with stone tablets, listing the names of every person who travelled on the 11 ships sailing from Britain. Collins, whose interest in the project was driven by discovering his own convict heritage, has since included a tribute to the second fleet. This is more of a pilgrimage site than a tourist attraction. Most travellers find it by accident, stopping at the public facilities which adjoin the memorial. It was strangely moving though, walking around the gardens reading the names of this country’s first European ancestors, who thought Australia was unpopulated (Terra Nullius). Terra Incognito might have been a more apt term, meaning unknown lands which had not yet been explored. The original inhabitants were there, though seldom seen. Early explorers made ship’s log entries about seeing plumes of smoke, from fires deliberately lit by Aborigines as a means of caring for and regenerating an arid land. As most Australians are now aware, even if they were not taught the history at school, the original inhabitants pre-dated the first fleet by at least 40,000 years. Australia Day as we celebrate it now, with thong-throwing competitions, colonial re-enactments and cockroach racing, is grossly insulting to the First Nations people, the Aborigines. I could go on, but you all know the stories of land-grabbing, exploitation, the spread of (European) diseases, genocide and our often misguided removal of children from their families. There was the grand gesture, the Stolen Generation apology in 2008 by former PM Kevin Rudd. Apology aside, nothing can make that right. All we Anglo-Saxon Australians can do is to make symbolic gestures, like outspoken songwriter Paddy McHugh did at The Dag (a sheep station converted into a wedding reception and conference centre and alt-country music venue). He began his set by acknowledging the original owners of the land and then, the current owner. We could all do this when the occasion arises, but so few of us do. On Australia Day we went on a vintage train excursion from Warwick to Nobby, along with 90 other people, many of them sporting Australia Day paraphernalia and greeting friends with “Happy Australia Day”. Excuse me, but this country’s blood-soaked history is nothing to be happy about. As indigenous journalist Stan Grant said, in a stirring speech which has been seen around the world, Aborigines were “marooned on the tides of history to the fringes of Australian society”. Still, is there really any harm in tourists using a public holiday to spend some money keeping the smoky smell of our colonial days alive? The Nobby craft shop, run by local volunteers, did solid trade, as did Rudd’s Pub, named not for a twice-ex Prime Minister, but the author Steele Rudd, of the Dad and Dave stories about sheep shearing and dances down the hall on a Saturday night, damper and billy tea. It is a long way removed from Carnarvon Gorge and its ancient painted rock walls. Songwriter Garry Koehler’s song The Gallery was inspired, he tells me, by the painted hands, which to him appeared to be reaching out; imploring, “Help – can you fix this mess?” Koehler told his audience in Tamworth last week that the rock carvings at Carnarvon date back 30,000 years. Well, 228 years if you want to be picky, but there has not been much to write home about for Australia’s aborigines since 1988. Indigenous musicians and kindred spirits had plenty to say though, notably Kev Carmody and Archie Roach, Yothu Yindi, also Shane Howard and Neil Murray, to name a few. You’ll have your own views on Australia Day, as do my 298 Facebook ‘friends’, and some of them have far more strident things to say. She Who Is Finally Mentioned favours calling January 26 “Survival Day”. It’s less negative than Invasion Day and many of this country’s 669,900 Aboriginal and Torres Strait Islander people already call it just that. They have survived, despite everything. Archie Roach, Australia Day, convicts, First Fleet, Kev Carmody, Kevin Rudd, Steele Rudd, Wisemans Crossing. Bookmark. Good one Bob: sent from another colony that cast away its Queen – actually it was KGVI then – but the poms were a bit more hands on over here in terms of pushing people around before independence and what went with it – like splitting off two Pakistans, one of which became Bangladesh, makings millions of moslems and Sikhs aliens in their own homes.